Sloppy Joe sandwiches are a great meal for a game day, kids' party, family event, or anything else. This recipe makes about 16 to 20 sloppy Joe sandwiches (adult sized portions) and will likely make more if you are serving them to kids. Don't be worried by the amount of time this recipe takes. It's mostly hands off! The sloppy Joes take about 4 to 5 hours in the slow cooker, so plan your timing accordingly. You'll want to serve the meat on sandwich buns. Be sure to get lots of extras, since somehow this recipe always makes a lot. If you are serving kids, consider buying slider buns. They are smaller than the full-size hamburger buns. Do toast your buns prior to serving. The toasting hardens the bread and prevents too much moisture from the meat to soak into the bread. If you don't toast the buns, they may quickly turn into a soggy mess. Either way, remember to put out lots of napkins. 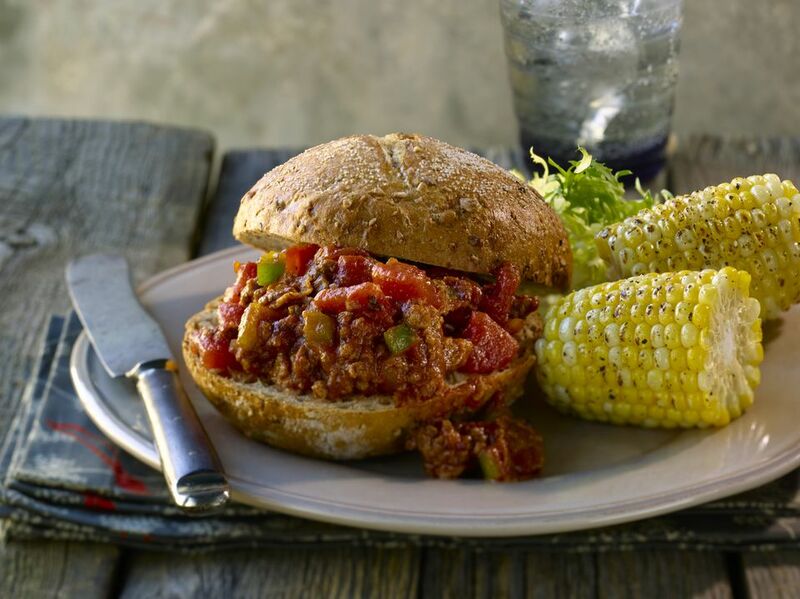 As their name implies, sloppy Joes can be a messy meal (toasted buns or not). Sloppy Joes work well with just about any side. Since they are a rich dish, you may want some coleslaw, baked beans, corn on the cob, or a bean salad as a side dish. If you prefer a leaner protein, try substituting ground turkey or ground pork for the ground beef. You likely won't notice a huge difference in taste. If you are serving a vegetarian crowd, you can also use textured vegetable protein instead of meat. This doesn't need to cook in the slow cooker, so could be made on the stove top as a vegetarian option with the traditional meat-based sandwiches that are made in slow cooker. If you have any leftover meat, store it in a sealed container in the fridge for 4 to 5 days. You can eat it as is, or as a topping for a baked potato or even hot pasta. If you have a lot of meat leftover, store it in a sealed container and freeze it. Defrost it in the refrigerator overnight or on the countertop and you'll have a family friendly dinner ready in no time. In a large deep skillet, sauté pan, or Dutch oven, brown ground beef with onions, celery, and green pepper; drain off fat. If your crock pot has a saute feature, use that to cook everything together. Drain the fat and proceed with the following steps. Place ground beef mixture in crockpot and stir in chili sauce, tomato paste, brown sugar, Worcestershire sauce, and pepper. Cover and cook on a low setting for 4 to 5 hours, stirring occasionally. Taste and adjust seasonings. Serve on toasted sandwich buns.